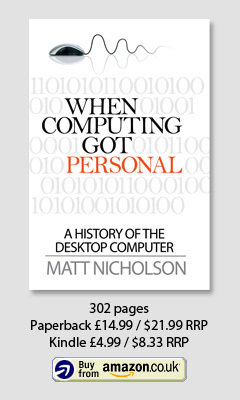 A full list of the material referenced in When Computing Got Personal: A history of the desktop computer by Matt Nicholson. Adamson, I., & Kennedy, R. (1986). Sinclair and the ‘Sunrise’ Technology. Penguin Books. Alsop, S. (1993, August 30). Newton deserved a better introduction, not a warmer reception. InfoWorld, p. 4. Anchordoguy, M. (1989). Computers Inc.: Japan’s challenge to IBM. Cambridge, Massachusetts: Harvard University Press. Andersen, P. (Director). (1984, December 13). Commercial Breaks (BBC2) [Motion Picture]. Anderson, J. J. (1984, July). Apple Machintosh; cutting through the ballyhoo. Creative Computing, p. 12. Anderson, T., & Galley, S. (1985). The History of Zork. The New Zork times, 4(1-3). Angwin, J. (1998, January 14). U.S. Judge Scolds Microsoft / Firm may wind up in contempt over tactics. San Francisco Chronicle. Antonoff, M. (1991, February). Gilbert Who? Popular Science, pp. 70-73. Apple Computer. (1990, May 28). Now that everyone agrees how a computer should work, try one that actually works that way. InfoWorld, pp. S24-25. Apple Computer. (1999, January 5). 800,000 iMacs Sold in First 139 Days. San Francisco. Arthur, C. (2012). Digital Wars: Apple, Google, Microsoft & the battle for the Internet. London: Kogan Page. Atack, C. (1988, October). From Atom to Arc. Acorn User. Atkinson, B. (2010, June 4). The Genius of Design 5: Objects of Desire. BBC2. Ballmer, S. (1996, June). Triumph of the Nerds: Part II. (R. X. Cringely, Interviewer) PBS. Banks, W. C. (1987, July 1). Desktop Publishing: The advent of laser-driven printers and page-layout programs has opened the publishing world to the era of the entrepreneur. Money Magazine. Bartimo, J., & McCarthy, M. (1985, February 11). Is Apple’s Laserwriter On Target? InfoWorld, pp. 15-18. Bateman, S. (1985, May). GEM: A New Look For IBM And Atari. Compute! (60), p. 22. Baum, D. (1994, May 9). Power Mac Migration. InfoWorld, p. 70. Berners-Lee, T. (1999). Weaving the Web: The Past, Present and Future of the World Wide Web by its Inventor. London: Orion Business Books. Blundon, W. (1996, October 1). Netscape outlines its vision for the future: NONE. JavaWorld. Boone, G. W. (1973). Patent No. 3,757,306. United States of America. Brick, M. (2001, June 28). U.S. Appeals Court Overturns Microsoft Breakup Ruling. The New York Times. Brown, J., Goldman, M., Gunter, T., Shahan, V., & Walker, B. (2007, July 23). Oral History Panel on the Development and Promotion of the Motorola 68000. (D. House, Interviewer) Computer History Museum. Brown, S. (2008, July 21). WarGames: A Look Back at the Film That Turned Geeks and Phreaks Into Stars. WIRED. Bunnell, D. (1975, August). Across the Editor’s Desk. Computer Notes, 1(3). Burkeman, O. (2009, October 23). The Day The World Changed. The Guardian: The Internet Turns 40. Carlton, J. (1997). Apple: The Inside Story of Intrigue, Egomania, and Business Blunders. New York: Random House. Cartwright, W., Peterson, M. P., & Gartner, G. (Eds.). (1999). Multimedia Cartography. Berlin Heidelberg: Springer-Verlag. Chandrasekaran, R., & Leibovich, M. (1999, January 15). Microsoft Witness Recants Monopoly View. Washington Post, p. E3. Chposky, J., & Leonsis, T. (1988). Blue Magic: The People, The Power and the Politics behind the IBM Personal Computer. London: Grafton Books. Clough, B., & Mungo, P. (1992). Approaching Zero: Data Crime and the Computer Underworld. London: faber and faber. CompuServe. (1984, April). Electronic Shopping Mall. Online Today. Connick, J. (1986, October). Steve Wozniak. Call-A.P.P.L.E. Cook, K. (1984, June 26). Digital Research Ties CP/M, DOS. PC Magazine, p. 39. Crabb, D. (1995, December). Copland, Where Are Thee? MacTech, 11(12). Cringely, R. X. (1992). Accidental Empires. Viking. Cringely, R. X. (Director). (1998). Nerds 2.0.1: Wiring the World [Motion Picture]. Dale, R. (1986, January). The Sinclair Story Part 2. Sinclair User(46). Dalziel, W., Sollman, G., & Massaro, D. (2005, January 3). Oral History Panel on 5.25 and 3.5 inch Floppy Drives. (J. Porter, Interviewer) Mountain View, California: Computer History Museum. DeLamartar, R. T. (1986). Big Blue: IBM’s use and abuse of power. New York: Dodd, Mead & Company, Inc.
Digital Research. (1984, May). Concurrent DOS bridges PC-DOS, CP/M. Digital Research News, 4(2), p. 3. Dobrzynski, J. H. (1993, February 1). IBM’s Board Should Clean Out The Corner Office. BusinessWeek. Dompier, S. (1975, May). Music of a Sort. People’s Computer Company, p. 8. Dvorak, J. C. (1996, October 22). Inside Track. PC Magazine. Edwards, B. (2008, August 15). Eight Ways the IMac Changed Computing. MacWorld. Faggin, F. (1992, March). The Birth of the Microprocessor. Byte, p. 145. Faggin, F., Feeney, H., Gelbach, E., Hoff, T., Mazor, S., & Smith, H. (2006, September 21). Oral History on the Development and Promotion of the Intel 8008 Microprocessor. (D. House, Interviewer) Mountain View, California, USA: Computer History Museum. Faggin, F., Shima, M., & Ungermann, R. (2007, April 27). Oral History Panel on the Founding of the Company and the Development of the Z80 Microprocessor. (M. Slater, Interviewer) Mountain View, California, USA: Computer History Museum. Fairhead, H. (1992). The 386/486 PC: Second Edition. Leyburn, North Yorkshire: I/O Press. Ferguson, C. H., & Morris, C. R. (1994). Computer Wars: The Fall of IBM and the Future of Global Technology. New York: Times Books. Gantz, J. (1985, March 11). The Revolution In In-House Publishing. InfoWorld, p. 32. Gates, B. (1976, April 10). Open Letter to Hobbyists. dr dobb’s journal of Computer Calisthenics & Orthodontia. Gates, B. (1993). Bill Gates Interview. (D. Allison, Interviewer) National Museum of American History, Smithsonian Institution. Goldberg, A. (1996, June). Triumph of the Nerds: Part III. (R. X. Cringely, Interviewer) PBS. Goldstine, H. H. (1992). Computers at the University of Pennsylvania’s Moore School, 1943-1946. Proceedings of the American Philosophical Society, 136(1). Goodell, J. (1994, June 16). Steve Jobs: The Rolling Stones Interview. Rolling Stone, 684. Gore, B. (1982, March). Your Computer, 2(3), p. 24. Government Information Office, Republic of China (Taiwan). (1984, May 27). IBM Accepts Redesign Of Computer System. Taiwan Today. Gray, S. B. (1984, November). The Early Days of Personal computers. Creative Computing, 10(11), p. 6. Heilemann, J. (2000, November). The Truth, The Whole Truth, And Nothing But The Truth: The Untold Story of the Microsoft antitrust Case. Wired, pp. 261-311. Hertzfeld, A. (2005). Revolution in the Valley. Sebastopol, CA: O’Reilly Media, Inc.
Hiltzik, M. A. (2000). Dealers of Lightning: Xerox PARC and the Dawn of the Computer Age. New York: HarperBusiness. Holt, R. M. (1998, September 22). The F14A Central Air Data Computer and the LSI Technology State-of-the-Art in 1968. Hughes, P. (1994, April 1). Interview with Patrick Volkerding. Linux Journal. InfoWorld staff. (1987, March 2). Industry Leaders Speculate on the Importance of New Macs. InfoWorld, 9(9), p. 17. Isaacson, W. (2011). Steve Jobs: The Exclusive Biography. London: Hachette Digital. Jobs, S. (1996, June). Triumph of the Nerds. (R. X. Cringely, Interviewer) PBS. Jobs, S. (1996, June). Triumph of the Nerds: The Rise of Accidental Empires. (R. X. Cringely, Interviewer) PBS. Jobs, S. (2010, June 7). The iPad: Past, Present, Future. (W. Mossberg, & K. Swisher, Interviewers) The Wall Street Journal. Johnston, S. (1991, July 8). Microsoft drops OS/2 2.0 API, revamps 32-bit Windows plans: Users face choice between OS/2 and Windows NT. InfoWorld, p. 1. Johnstone, B. (2003). Never Mind the Laptops: Kids, Computers and the Transformation of Learning. Lincoln, NE: iUniverse Inc.
Kampert, P. (2003, February 16). Low-key pioneer. Chicago Tribune. Karlgaard, R. (2013, September 2). Ahead Of Their Time: Noble Flops. Forbes. Kay, A. C. (1969). The Reactive Engine. University of Utah. Kay, A. C. (1972). A Personal Computer for Children of All Ages. Proceedings of the ACM National Conference. Boston. Kay, A. C., & Goldberg, A. (1977, March). Personal Dynamic Media. Computer. Kearns, D. (1997, March 31). Gang of Four goes after Microsoft. Network World, p. 28. Kehoe, L. (1997, February 25). Doubts Grow about Leadership at Apple. Financial Times. Kilby, J. S. (1959, Feb 6). Patent No. 3,138,743. United States of America. Lammers, S. (1986). Programmers at Work. Redmond, Washington: Microsoft Press. Lampson, B. (2006, October 18). The Alto and Ethernet System – Xerox PARC in the 1970s. Seattle, WA, USA: University of Washington: Computer Science and Engineering. LaPlante, A. (1990, May 28). Users Have High Hopes for 3.0. InfoWorld, 12(22), p. S39. Lazzareschi, C. (1989, February 19). APPLE: HAS IT LOST ITS BITE? Los Angeles times. King, M. (Producer), & Lee, R. (Director). (2001). The Secret History of Hacking [Motion Picture]. Channel 4. Lemmons, P. (1981, October). The IBM Personal Computer: First Impressions. BYTE, p. 26. Lemmons, P. (1983). A Guided Tour of Visi On. Byte, 1983(6), pp. 256-278. Lennox, J. (1985, August). Business With Pleasure. What Micro, pp. 15-18. Levy, S. (2004). Insanely Great. New York: Penguin Group. Levy, S. (2010). Hackers: heroes of the computer revolution. Sebastopol, CA: O’Reilly. Libes, S. (1979, May). Radio Shack Has Over 50 Percent of Personal Computer Business. Byte, 4(5), p. 117. Lichstein, H. (1963, November 20). Telephone hackers active. The Tech, 83(24). Linzmayer, O. W. (2004). Apple Confidential 2.0: The Definitive History of the World’s Most Colorful Company. San Francisco, CA: No Starch Press. Littman, J. (1993, September 12). The Last Hacker: He Called Himself Dark Dante. His Compulsion Led Him to Secret Files and, Eventually, the Bar of Justice. Los Angeles Times. Los Angeles Times. (1995, April 18). Mac Clones Due in May. Los Angeles Times. Mace, S. (1984, July 9). Amiga Demos its New Machine. InfoWorld, pp. 41-42. Mace, S. (1985, June 3). Laser Printers Open Markets. InfoWorld, p. 44. Mace, S., & Sorensen, K. (1986, May 5). Amiga, Atari Ready PC Emulators. InfoWorld, p. 5. Maraia, V. (2005). The Build Master: Microsoft’s Software Configuration Management Best Practices. Addison-Wesley. Markoff, J. (1983, November 21). Microsoft Does Windows. InfoWorld. Markoff, J. (1994, December 29). For Apple, Clones and Competition. The New York Times. Markoff, J. (1996, December 23). Why Apple Sees Next as a Match Made in Heaven. The New York Times. Markoff, J. (2005). What the Dormouse Said. Viking. Martin, M. H. (1996, February 19). Paradise Lost. Fortune. McCarroll, T. (1984, December 24). Computers: A Flop Becomes a Hit. Time. McTiernan, C. E. (1998). The ENIAC Patent. IEEE Annals of the History of Computing, 20(2), pp. 54-58. Metcalfe, B. (1995, August 21). Microsoft and Netscape open some new fronts in escalating Web Wars. InfoWorld, p. 35. Metcalfe, B. (1995, September 18). Without case of vapors, Netscape’s tools will give Blackbird reason to squawk. InfoWorld, p. 111. Microsoft Limited. (1989). IBM AND MICROSOFT EXPAND PARTNERSHIP; SET FUTURE DOS AND OS/2 DIRECTIONS. London: Text 100. Microsoft v. USA, 97-5343 (Court of Appeals for the District of Columbia April 21, 1998). Miller, M. J. (1990, May 28). Windows 3.0: Worth the Wait. InfoWorld, 12(22), p. S1. Moeller, M., & Dodge, J. (1996, June 17). Netscape’s Andreessen eyes ‘Internet OS’. PC Week. Money Programme, BBC2. (2011, December 14). Steve Jobs: Billion Dollar Hippy. Moore, D. G. (1965, April 19). Cramming more components onto integrated circuits. Electronics, 38(8). Moore, D. G. (1975). Progress in Digital Integrated Electronics. Technical Digest, pp. 11-13. Moore, G. E. (1995, March 3). Interview with Gordon E. Moore. (R. Walker, Interviewer) Stanford University. Moore, J. (Director). (2001). Revolution OS [Motion Picture]. Morris, P. R. (1990). A history of the world semiconductor industry. London: Peter Peregrinus Ltd.
Mott, T. (2010, June 4). The Genius of Design 5: Objects of Desire. BBC2. Müller-Prove, M. (2002). Vision and Reality of Hypertext and Graphical User Interfaces. Universität Hamburg, Fachbereich Informatik. Nelson, T. (1987). Computer Lib. Redmond, Washington, USA: Microsoft Press. Nelson, T. (1987). Dream Machines. Redmond, Washington, USA: Microsoft Press. New York Times. (1985, October 1). Digital Research to Modify GEM. New York Times. (1987, March 25). Company News; Atari, Commodore Settle. New York Times. Newbart, D. (2001, June 1). Microsoft CEO take launch break with the Sun-Times. Chicago Sun-Times, p. 57. Nicholson, M. (1986, October). Amstrad PC1512. PC PLUS(1). Nocera, J. (1999, March 1). Witnesses in Wonderland On trial in Washington, Microsoft saw its witnesses get skewered, its video crash, and its prospects for victory take a serious turn for the worse. Fortune Magazine. Noyce, R. N. (1959, July 30). Patent No. 2,981,877. United States of America. Olmos, D. (1988, March 3). Chip Shortage Strains Computer Makers. Los Angeles Times. O’Reilly, R. (1987, November 26). IBM Finds Key to Many New Rooms With OS/2. Los Angeles Times. Parker, R. (1990, December 24). Two Giants With Own Views. InfoWorld, p. 8. Parker, R. (1991, April 1). IBM’s Marketing of OS/2 May Have Stunted Its Growth. InfoWorld, p. 38. PC User staff. (1989, January 14). Year in, Year out. PC User, p. 13. PC’s Limited. (1987). Personal Computer Catalog. Dell Computer Corporation. Penenberg, A. L. (2009). Viral Loop: The Power of Pass-it-on. London: Hodder & Stoughton. Petrosky, M. (1987, February 2). AppleShare airs at last. Network World, p. 4. Pollack, A. (1990, March 24). Most of Xerox’s Suit Against Apple Barred. The New York Times. Poor, V. (2004, December 8). Oral History of Victor (Vic) Poor. (G. Hendrie, & L. Shustek, Interviewers) Melbourne, Florida, USA: Computer History Museum. Postel, J. (1981). Request for Comments: 801. Network Working Group. Quinlan, T., & Borzo, J. (1994, March 14). Power Macintosh banks on winning Windows users. InfoWorld, p. 1. Ranney, K. (1986, January 20). Apple Planning ‘Open’ Mac. InfoWorld, 8(3), p. 1. Raymond, E. S. (Ed.). (1991). The New Hacker’s Dictionary. London: The MIT Press. Raymond, E. S. (1999). The Cathedral and the Bazaar. Sebastopol, CA: O’Reilly & Associates. Raymond, E. S. (2003). The Art of Unix Programming. Pearson Education. Rebello, K. (1996, July 15). Inside Microsoft. BusinessWeek. Rebello, K., & Arnst, C. (1992, November 29). ‘The Great Digital Hope’ Could Be A Heartbreaker. Businessweek. Rheingold, H. (1985). Tools for Thought. New York: Simon & Schuster. Roberts, E. (1976, November). Charlatans, Rip-off Artists and Other Crooks. Computer Notes. Rose, F. (1989). West of Eden: The End of Innocence at Apple Computer. London: Century Hutchinson. Rosen, B. M. (1979, July 11). VisiCalc: Breaking the Personal Computer Software Bottleneck. Morgan Stanley Electronics Letter. Rosoff, M. (2005, November). The Antitrust Price Tag. Directions on Microsoft, p. 46. Salomon Brothers Inc. (1994). Personal Computer Hardware. Salus, P. H. (1994, October). Unix at 25:The history of Unix is as much about collaboration as it is about technology. BYTE. Satchell, S. (1986, December 22). ALR Access 386: Early Entry Performs Well Despite Shortcomings. InfoWorld, p. 49. Sather, J. F. (1983). Understanding the Apple II. Chatsworth, CA: Quality Software. Saxby, S. (1990). The Age of Information: The Past Development and Future Significance of Computing and Communication. Macmillan. Scannell, E. (1988, September 12). Extended AT Bus Poses Threat to IBM. InfoWorld, p. 1. Schaller, R. R. (2004). Technological Innovation in the Semiconductor Industry: A Case Study of the International Technology Roadmap for Semiconductors (ITRS). Schlender, B., & Woods, W. (1997, March 3). SOMETHING’S ROTTEN IN CUPERTINO AS CEO GIL AMELIO AND AN INEFFECTUAL BOARD DITHERED, APPLE COMPUTER LOST MARKET SHARE AND FADED INTO INSIGNIFICANCE. NOW STEVE JOBS HAS RETURNED, WITH A TURNAROUND STRATEGY THAT COULD MAKE APPLE HIS ONCE AGAIN. Fortune. Schmalensee, R. (1982, June). Another Look at Market Power. Harvard Law Review. Schrage, M. (1984, January). Alan Kay’s Magical Mystery Tour. TWA Ambassador, p. 36. Schulman, A. (1993, September 1). Examining the Windows AARD Detection Code. Dr. Dobb’s. Schwartz, J. (2001, June 29). The Judge: A Court Overturned by an Appearance of Bias. The New York Times. Scott, D. (1981, August). Your Computer, 1(2), p. 20. Scott, J. (Director). (2005). BBS The.Documentary [Motion Picture]. Sculley, J. (2011, December 14). Steve Jobs: Billion Dollar Hippy. Money Programme. BBC2. Seidner, R. (1996, June). Triumph of the Nerds: Part II. (R. X. Cringely, Interviewer) PBS. Simpson, R. (1997, September 15). A Talk with the Father of Computing. Wired. Sinclair User. (1985, March). Sir Clive hits out in pub punch-up. Sinclair User(36). Sjouwerman, S. (2006, November 20). Ballmer: “Linux Users Owe Me Money”. WServerNews, 11(47). Slater, R. (1987). Portraits in Silicon. Cambridge, Massachusetts: The MIT Press. Speigelman, L. L. (1987, March 23). Developers Ready Mac SE-Compatible Portables. InfoWorld, p. 25. Stephenson, N. (1999). In the Beginning… Was the Command Line. New York: HarperCollins. Sutter, H. (2005, March). The Free Lunch Is Over. Dr. Dobb’s Journal, 30(3). Swaine, M. (1997, April 1). Gary Kildall and Collegial Entrepreneurship. Dr. Dobbs. Tesler, L. (1996, June). Triumph of the Nerds: Part III. (R. X. Cringely, Interviewer) PBS. Tesler, L. (2010, June 4). The Genius of Design 5: Objects of Desire. BBC2. The Modesto Bee. (1984, August 22). Atari sues over chips. The Modesto Bee, pp. D-11. The New York Times. (1990, June 6). Windows 3.0 Sales At 100,000 Copies. The New York Times. The New York Times. (1996, December 31). New Apple Chief got $3 million. The New York Times. Thomas, J. (1997, September). Rhapsody in Redmond. Developer Network Journal, p. 14. Thompson, T., & Baran, N. (1988). The NeXT Computer. Byte. Tomczyk, M. S. (1984). The Home Computer Wars: An Insider’s Account of Commodore and Jack Tramiel. Greensboro, North Carolina: COMPUTE! Publications. Torvalds, L. B. (1991, August 26). What would you like to see most in minix? Retrieved June 28, 2013, from comp.os.minix. Truss, L. (2003). Eats, Shoots and Leaves: The Zero Tolerance Approach to Punctuation. London: Profile Books. USA v. Microsoft, Civil Action 94-1564 (SS) (United States District Court for the District of Columbia July 15, 1994). USA v. Microsoft, 98-1232 (United States District Court for the District of Columbia November 9, 1998). USA v. Microsoft, 253 F.3d 34 (United States Court of Appeals for the District of Columbia Circuit June 28, 2001). Valloppillil, V. (1998, August 11). Open Source Software: A (New?) Development Methodology. Visich, M., & Braun, L. (1974). The Use of Computer Simulations in High School Curricula. State University of New York at Stony Brook, Huntington Computer Project. Wallace, J., & Erickson, J. (1992). Hard Drive: Bill Gates and the Making of the Microsoft Empire. New York: John Wiley & Sons. Warnock, J. (1996, June). Triumph of the Nerds: Part III. (R. X. Cringely, Interviewer) PBS. Warren, J. C. (1976, July). correspondence. SIGPLAN Notices, 11(7), 1-2. Weber, J. (1993, June 19). Apple Computer’s Sculley to Give Up CEO Position. Los Angeles Times. Webster, R. (1987, December). Alan Kay: face values. Personal Computer World, pp. 128-135. Weik, M. H. (1961, January). The ENIAC Story. ORDNANCE. Williams, G. (1982, December). Lotus Development Corporation’s 1-2-3. BYTE, pp. 182-198. Williams, G. (1984, February). The Apple Macintosh Computer. BYTE, p. 30. Williams, G., & Moore, R. (1984, December). The Apple Story Part 1, An Interview with Steve Wozniak. BYTE, p. A67. Williams, G., & Moore, R. (1985, January). The Apple Story Part 2: An Interview with Steve Wozniak. BYTE, p. 167. Williams, M., & Krazit, T. (2004, December 13). IBM Sells PC Unit to Lenovo. InfoWorld, p. 18. Wolf, G. (1994, October). The (Second Phase of the) Revolution Has Begun. Wired, 2(10). Wolf, G. (1995, June). The Curse of Xanadu. Wired(3.06). Wozniak, S., & Smith, G. (2006). iWoz. London: Headline Review. Zachary, G. P., & Yamada, K. (1993, May 25). What’s Next? Steve Jobs’s Vision, So on Target at Apple, Now is Falling Short. Wall Street Journal. Zaks, R. (1981). From Chips to Systems: An Introduction to Microprocessors. Sybex.